Last Dominion Lost feature a trio of Berlin resident Australians including Jon Evans, John Murphy and Julian Percy. The original formation of Last Dominion Lost, behind the 1992 recordings that surfaced on The Tyranny of Distance, featured ex-SPK members John Murphy and Dominic Guerin (as well as Jon Evans), while their 2014 studio album, Towers of Silence, included Murphy (along with Jon Evans and Julian Percy), with lyrics from Annie Stubbs who had also spent time in the SPK ranks. Recorded in Australia in the early nineties The Tyranny of Distance was mastered from the sole remaining cassette copy of home studio sessions when the original trio were recording under working names such as DOM and Merge. The appearance of The Tyranny of Distance was as unexpected as it was revealing; many observers regarded it as a missing piece in the history of SPK. Fast forward to 2008 and now living in Berlin, Murphy and Evans reconvened along with Julian Percy (Ratbag) to form the current formation of Last Dominion Lost with the addition of Ash Wednesday (Crashlands, Einstürzende Neubauten) resulting in the 2014 album Towers of Silence which took their improvised sessions of drums, electronics, guitars and spoken word into a studio setting. Towers of Silence was a more vocal based take on post industrial rhythms and atmospherics. Many words have been written about how Last Dominion Lost continue the legacy of SPK, and in many ways Snowdrops From A Curate's Garden does and it does more so than their previous releases. SPK were of course named after a group of mental patients in West Germany and Snowdrops From A Curate's Garden looks to the early settlers to Australia, many of whom, as the press notes states, were "drawn from the classes of the poor, dispossessed and desperate" and subsequently as a result of the conditions they were subjected to found themselves confined to asylums. Like SPK who expressed the content of various psycho-pathological conditions in their earlier releases, Last Dominion Lost consider the circumstances and condition that impacted the early settlers "effectively made mental illness ... one of the colony's very first imports." 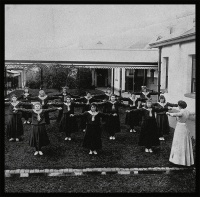 Snowdrops From A Curate's Garden features a number of archival photographs of Australia's mental institutions along with a cover shot featuring an exercise session of patients at one of Australia's mental institutions. None of the tracks on Snowdrops From A Curate's Garden feature on any of the two albums of Last Dominion Lost, but a couple of them have appeared on limited audience only CD and vinyl releases to accompany live festival performances. There is also a wonderful live video recording of 'Shell in the Chamber' recorded by Network Awesome at NK Berlin in 2012 available on youtube. Recorded live at the Kalyug Festival, Berlin in 2011 Snowdrops From A Curate's Garden, named after the pornographic writings of a novel from Aleister Crowley, shares the same palette of sounds that featured on Towers of Silence but here they are forged into a live setting providing a harsher more ritualised set of industrial noise and atmospherics. Snowdrops From A Curate's Garden opens to the unmistakable thunder of John Murphy's drumming. Laced with guitar feedback and windswept electronics with the occasional burst of taped debris, together with hollered and spoken vocals the harsh dense onslaught of 'Shell in the Chamber' could to the uninitiated be easily mistaken for a prime slice of Japanoise. But the sound of Last Dominion Lost performed by these veterans of industrial music harks back to and has its roots in early post-industrial electronics. The trio step down a gear or two for 'Junk DNA' with an amalgamation of drones and drums. Voices here are delivered either as a twisted voiceover - the only phrase I can make out is a reference to "modern science" - or as an assemblage of cries, moans and screams of the patients, against ritual like drum rolls. A disturbed presence hangs over the processed voices, just as they do on 'Wolfsquinte' too. The atmosphere of 'Wolfsquinte' is much more ominous reflecting the confined conditions of the patients where distorted electronics, processed effects and the disturbing fixture of shredded moaning voices are set against rattling chains and the clank of metal drums. The first side closes on 'Speed Racer', an unyielding evocation of revved up electronics, sliced with shrill frequencies and the by now ever present mass of disturbed voices. Heavy and unrelenting, it's an inventive take on industrial noise, on an album that seeks beauty and transcendence from the depths of despair. Opening the second side is 'Erbkrank' that translates as hereditary disease. It shares its title with a Nazi propaganda film designed to demonise mental patients using footage from German psychiatric hospitals. With atmospheric and droning electronics over pensive ritual drum rolls it is by far the most restrained offering on Snowdrops From A Curate's Garden. It's followed by 'Ritual in the Dark' which was of course one of Colin Wilson's Gerard Sorme novels about a serial killing outsider. And while that may account for the title the music goes elsewhere. Moody and atmospheric, the harsh electronic shudders, ritual wails and disturbed voices from disturbed minds are anchored around spartan hollow drum beats. Amidst the chaos there's a definite structure within its gruelling movements. An overriding feeling of desolation and despondency hangs over the industrial noise atmospherics of 'Abjection'. Eschewing rhythms and percussive flourishes it opts for explosiveness from bleak churning shudders riddled with frequency input and occasional blasts of guitar noise. Rhythms return on the dark atmospherics of the final track 'Perdue'; another restrained offering of undulating drones with the clang of percussive elements in the form of hollow metal drums thuds. The live performance captured on Snowdrops From A Curate's Garden predates the studio recording of Towers of Silence. Towers of Silence transformed the live improvisations of Last Dominion Lost into a more polished and layered offering, with a couple of tracks resembling KnifeLadder, a UK based industrial polyrhythmic trio featuring John Murphy alongside Hunter Barr and Andrew Trail. It was one of John Murphy's main musical concerns before visa issues prevented his return to the UK. While Snowdrops From A Curate's Garden shares a musical palette with Towers of Silence, if it resembles anything in the works of Last Dominion Lost it is in the experimental industrial atmospherics of 'The Will To Win' and 'Hell To Pay' found on the early recordings of The Tyranny of Distance. It's worth pointing out that Towers of Silence sought inspiration from Zoroastrian and Tibetan funeral traditions but it is Snowdrops From A Curate's Garden that provides a fitting tribute to John Murphy who sadly passed away in October 2015. In its own way it brings things full circle and back to John's love of ritual music wrapped up in post-industrial atmospherics.